If your womb is calling for a new beginning, now is the perfect time to join a community of over 180,000 women participating in Womb Blessings and truly connect to the feminine fertility inside of you. Like my client Jess, who had a remote Womb Energizer with me exactly one year ago. Even though we were miles apart, she said she could feel me behind her as we began the session. She was literally moved to tears as the light began to pour through her crown chakra and into her heart and womb. 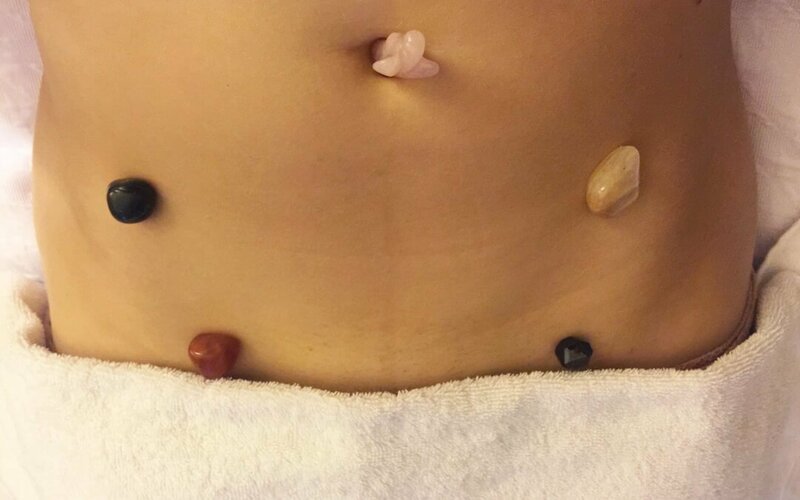 As Jess placed crystals on the 5 energy points we focus on (shown in the picture she sent me before we started), she knew she was READY for her 2nd round of IVF. Her certainty was beautiful and striking, because when I’d worked with Jess earlier that year, she was stuck emotionally. She needed to process multiple failed cycles, plus a lot of hurt between her and her husband. She felt alone and defeated. By the time we did our Womb Blessing only a few months later, she was in a completely different place. She was relaxed, centered, and ready to receive her baby. Even though our Womb session was done entirely over the phone, both of us could FEEL the energy flowing through her entire body, especially her womb. And amazingly just before our session began, her period arrived–perfectly timed for her IVF cycle to get started! 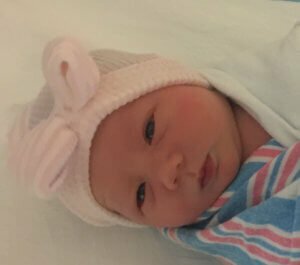 “I’m happy to announce that we welcomed our daughter into this world on June 15th. She was conceived during our second round of IVF in September 2016. We are over the moon in love! We did a Womb session in late August before I began my IVF meds. We also did 1-on-1 coaching calls in Dec 2015-Feb 2016 to help heal from the first IVF attempt and face many of the fears I had been harboring. Thank you for your work and support throughout this journey! We plan to begin expanding our family later this year and I will be reaching out for another Womb Blessing when the time comes. Her story could be your story! If you want to open your womb in relaxed readiness to receive your baby–whether you’re preparing for a treatment cycle or you’re preparing to get pregnant naturally, grab your 1 hr 40 minute Womb Blessing & Healing session with me. I’m doing these Womb Blessings locally in Toronto, and I’m also offering distance Womb Energizers for those of you who aren’t local or who can’t travel to see me. The Womb Energizer is not exactly the same as an in-person Womb Blessing, but it is also very powerful and has had remarkable results for many of my clients. If you’ve been reading about Womb Blessings over the past few weeks and longing to give yourself this gift, book a Womb Blessing with me now.